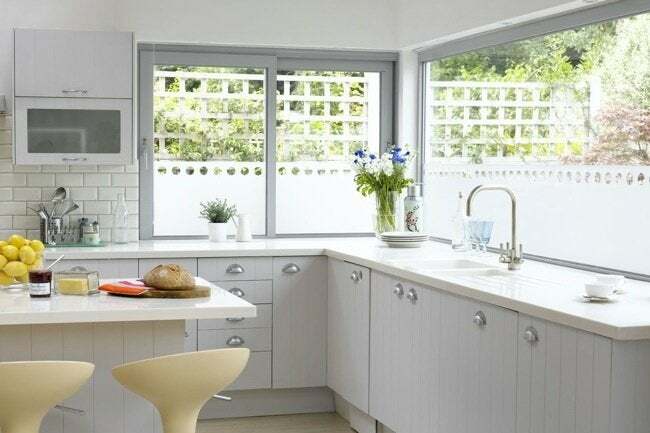 An affordable option for the average homeowner, installing window film enables you to dress up your windows with a new look or dramatically increase their level of energy efficiency. Window films are like sunglasses for your house, inexpensively improving the energy efficiency of your home, even as they add privacy and decorative flair. Installed indoors, either by professionals or with a do-it-yourself kit, window films typically consist of a polyester base covered with a scratch-resistant coating. There are two basic types of window films: decorative and sun-screening. The former may be used in lieu of curtains or blinds to introduce privacy, although in contrast to regular window treatments, they do not impede the path of natural light. 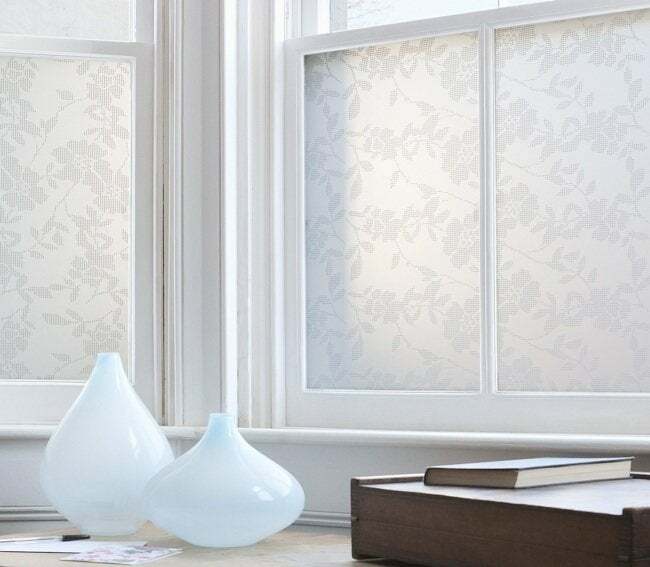 Often applied to interior windows, such as transoms and room dividers, decorative window films are available in a wide variety of style, including those that mimic rice paper, etched or frosted glass, stained glass and crystal. Remember that a window with decorative film must remain closed in order to perform its role as a privacy screen. If you require both privacy and the free movement of air, you’re better off pursuing a different strategy (privacy landscaping is one alternative that might enable you to meet your twin goals). Sun-screening window films are either tinted or reflective, their cast ranging from near transparency to darker metallic shades like copper, tin, and gold. Newer ceramic-based films are virtually invisible, but they control room brightness, reduce solar heat gain, and guard home furnishings against fading. Whether decorative or sun-screening, window films save you money. For starters, decorative films enable you to create the effect of artisan glass for a fraction of what the genuine article would cost. 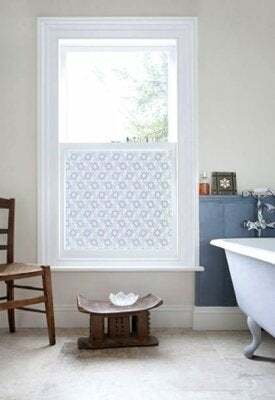 Whereas vintage or reproduction stained-glass panels command a pretty penny, a window film that mimics the look is, for the average homeowner, a budget-friendly option. Sun-screening window films invite savings by lowering your monthly heating and cooling bills. According to the International Window Film Association (IWFA), installing a window film can provide seven times the energy savings provided by replacement windows (per dollar spent). In the summer, window films reflect or absorb the warming rays of the sun. Your home remains cooler as a result, and your air conditioner does not need to work as hard to maintain a comfortable temperature. In the winter, some modern window films provide a layer of insulation that keeps heat from escaping. Sun-screening window films also block ultraviolet, protecting your furniture, carpets, wall coverings and paint jobs from fading over time. In addition, window films offer shatter resistance. If your window glass were to break, the film would prevent hazardous shards from flying into a thousand different directions. If your windows are still under warranty, be sure to read the agreement closely, as the addition of window film may void the contract. Do your research, however, as some companies specializing in window film installation offer a warranty that would complement the one from your window manufacturer. Not under warranty? Then you will most likely discover that installing window film is a straightforward process. Before you begin, make sure that your windows are squeaky clean. Though some easy-install films adhere on the static-cling principle, most require a bit more labor. The steps involved are usually some permutation of the following: Cut the film to size, remove its backing, wet the film or the window (or both), position the film, eliminate all air bubbles and trim any excess film. Even after their initial application, many films can be repositioned if necessary, relieving you of the pressure to get it right the first time. Certainly, it’s worth the effort to transform a plain old piece of glass into a dazzling pane of color or an energy-saving workhorse!